Beautiful Indian Cucumber and Coconut Salad with Peanuts and Fresh Coconut from the state of Maharashtra.This Indian Cucumber Salad is not only healthy but super yummy! If I have to make a salad, in India, I always think of cucumber first.Somehow that’s the easiest filler in my mind and everything else comes in later. Recently I have started researching on healthy indian salads.It is pretty misleading because most restaurant here either serve green salad or fancy stuff with heavy dressings but the fact is that – Indian cuisine is actually very rich in Salads. The cuisine in fact is as healthy as your choices.I have several indian salad options on the blog- do check Indianised Lebanese Tabouleh Salad,Power Packed Chickpeas Tahini Salad ,Cottage Cheese and Tomato Salad & Foxtail Millet Salad. 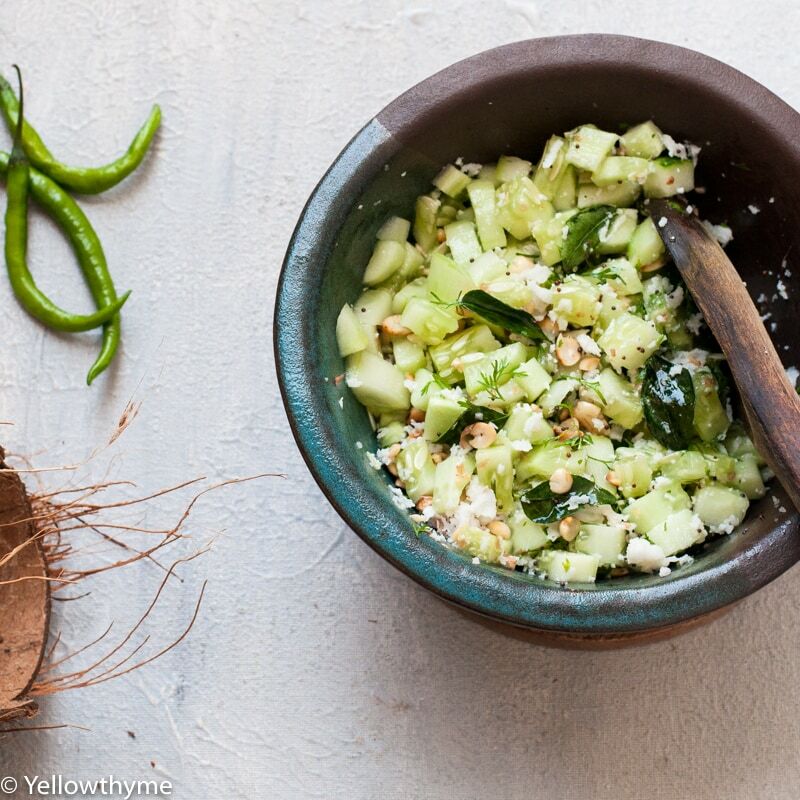 This Indian Cucumber Salad hits all the right spots in fact too many right spots its immensely crunchy because of fresh cucumbers and peanuts.The tempering makes is super flavoursome and the fresh coconut adds great body to it. There is a reason cucumber salads rule! and that’s cause they stay fresh and don’t get soggy with time.So these cucumber salads like Thai Sweet and Spicy Cucumber Salad and this Indian Cucumber and Coconut Salad is a great lunch box option.You can toss everything together in the morning and pack it up for lunch. Is Indian Cucumber and Coconut Salad Healthy? Its Vegan- no dairy products used and hence obviously Vegetarian.Replace the peanuts with cashews or almonds and It becaomes Whole30, Paleo, Keto Approved! It’s low carb but has a good amount of fat from the coconut and the tempering to make it very filling. Heat oil in a small pan.Once its hot, add Mustard seeds, green chilli and curry leaves. Other great Salads that are not only easy to make but are also filling!